For each protein (egg white) you need 50 grams of sugar. This means that we need 200 grams of sugar for 4 proteins. We’ll use this ratio throughout the recipe, it’s easy! 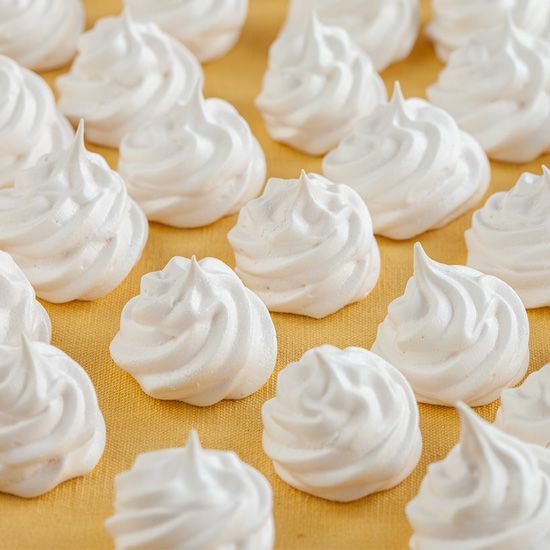 This is the classic recipe for making meringues, plain and simple. Usually you’ll find a variation of the original recipe, therefore it seemed useful to include the original recipe here. This is the most important step: make sure your mixing bowl is fat-free and clean. De-grease by using a little bit of lemon juice and paper towels. The reason for this is that you won’t be able to beat the egg whites in a greasy mixing bowl. Pour the four egg whites into the mixing bowl and whisk at medium speed. The protein is stiff enough when you can hold the mixing bowl upside down without the protein falling out of it. Now turn the mixer up to the highest setting, gradually pour the sugar into the beaten egg whites. Don’t dump it all at once. Mix for about 6 to 7 minutes on the highest settings. Then stop the machine. Take a little mixture between your thumb and forefinger and rub. It’s done when it feels velvety and it looks kind of glossy. Heat up the oven to a temperature of 110 degrees celsius (230 fahrenheit). Insert a nozzle to choice into the piping bag. Spoon the meringue mixture into said bag. Place the silicone mat onto the baking tray. Press the mixture trough the nozzle onto the silicone mat in fun shapes. Do this until the whole mixture has been used up. Bake for about 1 hour. Depending on the thickness and shape of the meringue this can take longer. Be sure to check once in a while. Let cool off completely, then enjoy! Thank you for your comment! It’s no problem at all to add a little flavoring, be careful when you do so cause you don’t want to overdo it. After adding the sugar slowly it got very liquididy and lost all the texture I had mixed it to. is it supposed to? That’s not suppose to happen :( Did you clean your bowl before adding the egg whites? I always use lemon juice for this, but it also works with vinegar. Did you beat it long enough before adding the sugar? 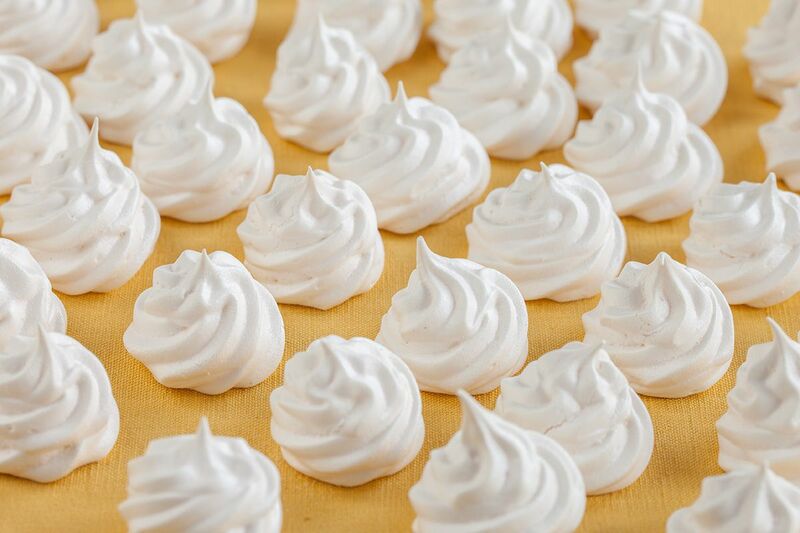 Long enough means the egg whites form stiff peaks already. And did you keep on beating it on high speed while adding the sugar? Otherwise than those things I’m familiar with going wrong, I’m not sure why you didn’t got the beautiful glossy egg whites. Hi Kail, they will be white as can be seen in the pictures. Hi. 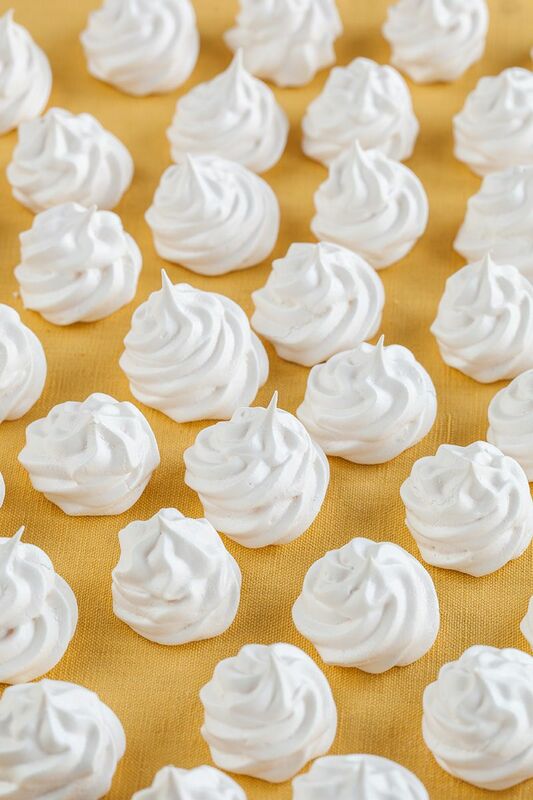 I’m making Christmas tree themed meringues. When should I add color to the batter, or should I at all? A reply ASAP would be great.